The title makes you think of gushing water, doesn’t it? I’m actually talking about Robert. And let me make it absolutely clear that I mean the title as a compliment, not as a put down. Robert is one of the most reliable people I know. If he says that he will do something, you can count on his keeping his word. He’s faithful at church, at work, to his friends, and, most important to me, to his family. Robert vowed to love, cherish, protect, and provide for me. He does a great job at all of those, and he’s always seeking for ways to do better. And that gives me plenty of reason to love him. 7. He has supported and encouraged me as I have fought major depression, even though he has never suffered from clinical depression and doesn’t understand it. 8. He is helping me figure out how to improve the way my scattered ADHD brain functions. 9. He helps the girls with their homework so I can concentrate on making supper without that stress. 9. I never worry about “his” household chores not being done. Whether it’s taking out the garbage, mowing the lawn, raking/burn leaves, or ironing his clothes on Sunday mornings, he always takes care of it. And does a good job, too. 12. When he has a weekday off from work, he often gets up and takes the girls to school so I can sleep in. I really admire Robert’s steady personality and strong character. I’m so happy to be his wife. 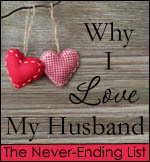 This post was inspired by the “Why I Love My Husband” link up party over at The Happy Wives Club. Click the button to read other wives’ stories of why they love their husbands. Wow, Robert sounds amazing. Like the man every woman hopes they marry but many don’t. You are a blessed woman and I really love #7 & #8 on your list. Those are both powerful statements about him. Thanks for linking up and I hope you’ll join us again next Thursday and continue adding on to your list :). You pegged him right, Fawn. I’m very blessed that he is my husband. His encouragement and support have made such a difference in my life, and I’ll always love him for it. What a beautiful tribute to your hubby! It is such a blessing to appreciate our husbands…for us and for them! Thank you, Carol! I agree that appreciating our husbands blesses us, too, and not just them.